Hate crimes against Muslims surged by 67% during 2015, according to new statistics released by the FBI on Sunday. The rise, far higher than in any other major category of hate crimes, came during a year marked by news of atrocities by the Islamic State and Donald Trump’s anti-Muslim rhetoric. The surge followed a similar rise in anti-Muslim hate crimes in 2014, when they rose 14% over the prior year. Anti-Muslim hate crimes were the only major category of hate crimes listed by the FBI that increased that year. In 2015, however, other categories also rose. Anti-Jewish hate crimes were up 9%, anti-black hate crimes increased by almost 8%, and anti-LGBT hate crimes rose by almost 5%. Anti-Latino hate crimes were unchanged. The year 2015 saw a great deal of news about Islamist attacks in Europe and in the United States, and the exploitation of these attacks by right-wing media and political figures very likely fueled anti-Muslim hatred. But what was likely even more important was Trump’s attacks on Muslims, including his infamous call for a ban on Muslims entering the U.S. In addition, many of Trump’s aides and surrogates embraced similar rhetoric. The Trump campaign also maligned blacks, Latinos and other minorities. The FBI statistics show that anti-Muslim hate crimes in the United States rose from 154 in 2014 to 257 in 2015. That is the highest number since 2001, when the Al Qaeda attacks on New York and elsewhere drove the number to its highest ever level, 481 hate crimes. The 2015 number of 257 may actually be six higher, because there were six anti-Sikh hate crimes listed in a brand new category, and Sikhs are often mistaken for Muslims. These numbers are only an indication of recent trends. 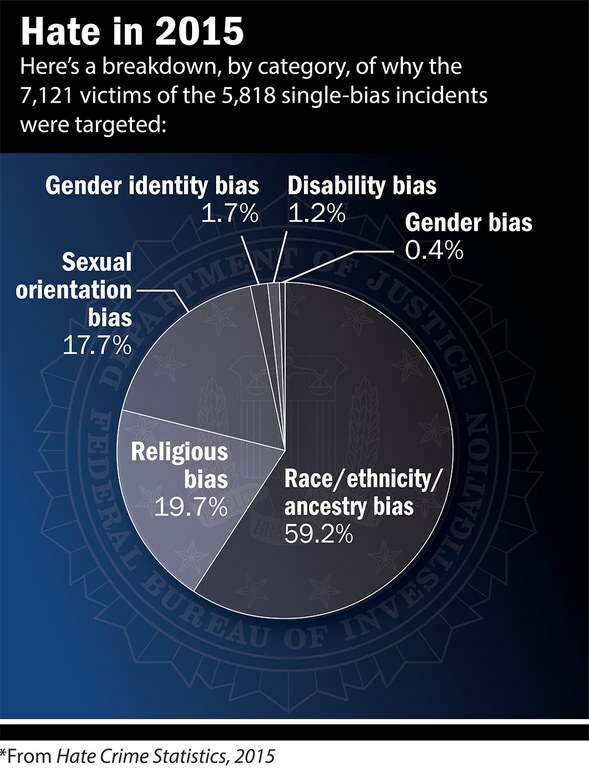 For a variety of technical reasons, including the failure of many people to report hate crimes to police, the real number of hate crimes is far larger than is indicated by the FBI statistics. A number of recent government studies shows that the real level of hate crimes in America has been nearly 260,000 a year in recent years. That works out to 25 to 40 times higher than the FBI numbers. The report comes as an apparent surge of hate incidents, most of them directed at Muslims, has been reported in the days following Trump’s election last week. As of this morning, the Southern Poverty Law Center, which set up a web page to collect reports, had compiled a list of some 315 incidents of hateful harassment and intimidation since Election Day.